Well, this little piece of news should be spurring the young Dominican males to even greater heights of frenzy when it comes to baseball. The Rangers have been reported to have signed on a 16 year old out fielder from the Dominican Republic, out fielder Nomar Mazara and to the tune of a little over 5 Million. During one of our beach vacations we stumbled upon a rather interesting sight. 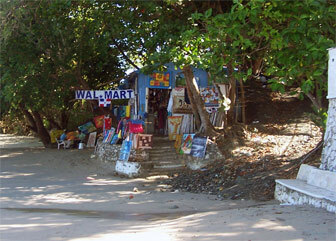 I bet you didn’t know there is a Wal-Mart in the DR! Well, it’s true (sort of), and we have pictures for proof. Now don’t expect the usual array of household items, electronic, automotive, garden and other items we’ve all come to know and expect while shopping at this retail giant. And the prices here were not exactly what I would call “mark down”. The DR Wal-Mart is a little more … well let’s say “Local”. Ok, it’s probably not an official retail store but we did find it rather entertaining. And if you squint your eyes well enough so you block out the rest of the surroundings and only see the sign, you can almost get that nostalgic feeling with this little taste of back home (well, almost).